9.7.2018 Our efforts to align a 2P microscope swiftly within <1 degree precision! Whether it is for tying one’s shoe laces or exploring the iPhone, we need to continuously practice new movements and acquire novel motor skills. Frontal cortex is one of the key brain areas participating in coordinating and learning of such voluntary movements. 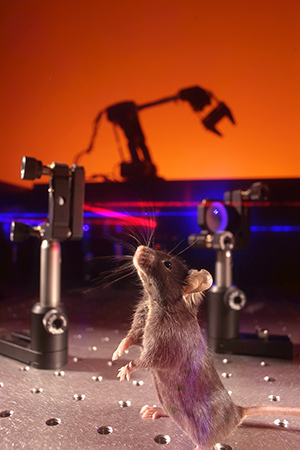 We use a series of innovative optical imaging methods, such as in vivo two-photon microscopy with fluorescent activity indicators, to record neuronal activity in frontal cortex circuits with single cell resolution and thereby gain a better understanding of the exact neuronal network dynamics underlying decision making and motor control. We work with mice as subjects since they are great manipulators and give access to a wide variety of important molecular tools and to well established models of motor diseases. Our experiments in rodents will ultimately help us to understand some of the basic neuronal mechanisms that govern our own actions, enabling us to solve new challenges.